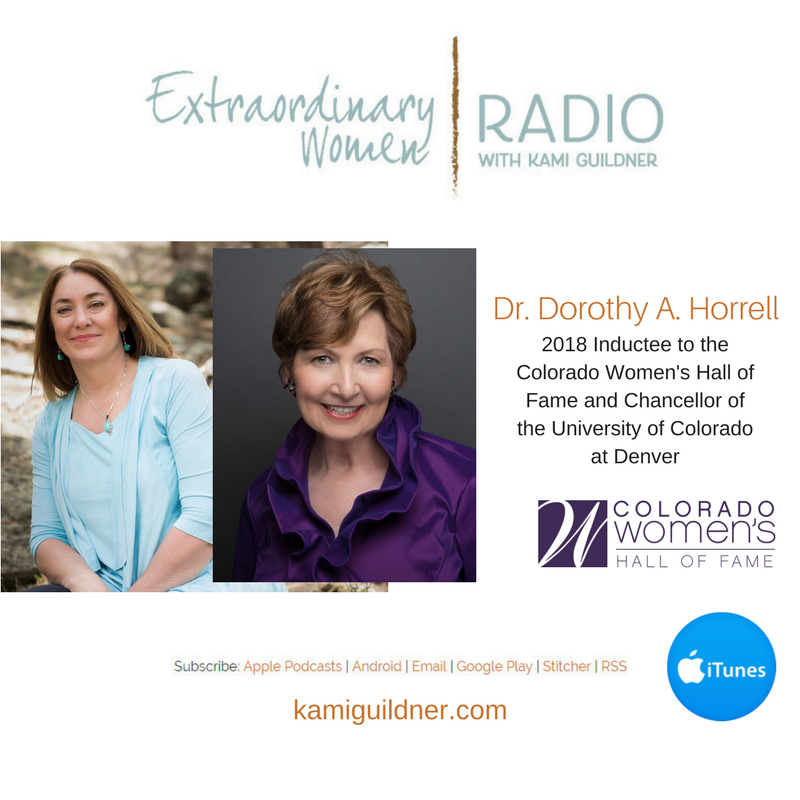 This week’s Extraordinary Women Radio interview is with a Colorado Women’s Hall of Fame 2018 Inductee, Dr. Dorothy A. Horrell. Dorothy is the Chancellor of the University of Colorado at Denver, my alma mater! I love this interview – we talk about success and courage and leadership and transformation. Dorothy tells her story of growing up on the plains of Colorado and finding her way to live in China for 8 months as a young woman. She shares the story of why she chose to come out of retirement to lead University of Colorado at Denver, and why she said yes. And in one of my favorite questions toward the end of the interview we talk about holding principles that we learned in 4H programs as young girls – around head, hand, heart and health – and how they shape our lives today. Dorothy and I shared a number of intersecting threads in our lives – and I think we both loved these connections. So much fun to discover! Dorothy leads Colorado’s public urban research university: CU Denver which educates over 15,000 undergraduate and graduate students annually in over 100 bachelor’s, master’s, doctoral and professional degree programs. Dr. Horrell brings an extensive background in higher education, having served as president of the Colorado Community College System , president of Red Rocks Community College , and as a governor appointee to the Colorado State University Board of Governors. From 2001-2013, she was president and CEO of the Bonfils-Stanton Foundation, Colorado’s leading foundation supporting the arts and nonprofit leadership. Her past community involvement includes service of the boards of Arrupe Jesuit High School, Clyfford Still Museum, Colorado Association of Funders, Governor’s P-20 Education Council, Denver Commission to End Homelessness, Commission on the Reform of Denver’s High Schools, Exempla Healthcare System, First National Bank of Colorado, West Chamber of Commerce Serving Jefferson County, Young Americans Bank and Jefferson Economic Council. In addition to being inducted into the Colorado Women’s Hall of Fame, Dorothy has been honored by the Colorado Women’s Chamber of Commerce: Top 25 Most Powerful Women and 2016 ATHENA leadership award; Colorado 4-H Hall of Fame; Public Education and Business Coalition– Investing in Education Award; Progressive 15 Alumni of the Plains; Colorado State University College of Applied Human Sciences Honor Alumna; and Mile High Council of Girl Scouts Woman of Distinction. Let’s dig in and meet Dr. Dorothy A. Horrell – a 2018 Colorado Women’s Hall of Fame Inductee! The Colorado Women’s Hall of Fame mission is to inspire by celebrating and sharing the enduring contributions of Colorado’s distinctive women. To achieve this, the Hall educates the people of Colorado about the stories of the women who shaped our state and the nation’s history with courage, leadership, intelligence, compassion, and creativity. Their talents, skills, struggles, and contributions form a legacy that the Colorado Women’s Hall of Fame is dedicated to protecting. I invite you to join us at the March 28, 2018 Colorado Women’s Hall of Fame 2018 Inductee Gala by purchasing your ticket here. Listen to other Colorado Women Hall of Fame inductee interviews from prior years.